System Simulation provide a whole range of collections management products covering books, archives and museum objects: BooksIndex+, ArchiveIndex+ and MuseumIndex+. We also provide enterprise strength products for digital image and digital asset management: ImageIndex+ and AssetIndex+. On top of all this we have a product for managing website content: ContentIndex+. Although all of these products are often deployed individually, they are also fully compatible and can be deployed as a powerful suite of integrated modules which complement each other. This suite of modules is CollectionsIndex+. 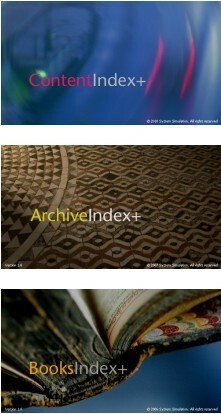 CollectionsIndex+ means that you can have your digital assets stored in ImageIndex+ or AssetIndex+. 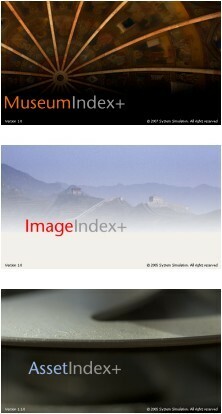 These images can then be used seamlessly in MuseumIndex+ or on your website via ContentIndex+. And all the collection information stored in the collections management products can flow onto a website which can have articles, themes and narratives easily authored to bring out the flavour, depth and relationships of your collection. So far, CollectionsIndex+ has been deployed at Eton College and the V&A. Features include user generated content management, StoryTeller, SiteManager, and powerful and easy-to-use integrated procedures and workflow. Supports OAI, XML, SPECTRUM, LIDO and other standards.